i-THRIVE Community of Practice members have held many events over the last year and a half to introduce people from their localities to i-THRIVE. The best events so far have been the ones that have managed to get representation from across the system (CAMHS, local authority, schools, charities) and families, children and young people themselves. 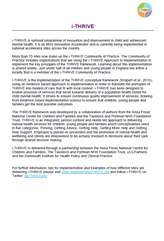 Below are some resources to support initial engagement with i-THRIVE. Provides a general overview of the i-THRIVE Programme. Provides introductions to the THRIVE Framework and i-THRIVE Programme. Provides introductions to the THRIVE Framework and i-THRIVE Programme and includes an exercise for use at a whole-system engagement event. Provides a concise overview of the key principles of the THRIVE framework and how to implement them. 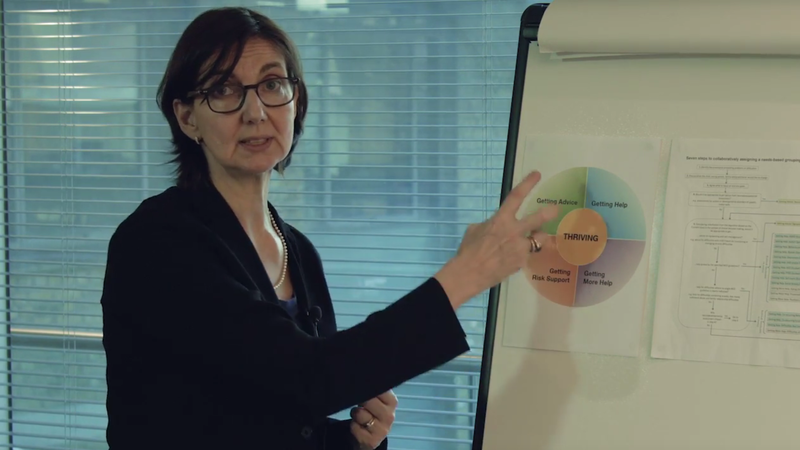 This video is of Miranda Wolpert providing a short, 5-minute introduction to the THRIVE Framework. You can download and print a one-page overview of the i-THRIVE Programme here to take to events or distribute to colleagues in your service or agency. You can also download a longer overview of the i-THRIVE Programme for a more detailed insight into the programme. Implementing THRIVE can feel like a big undertaking but there are many principles of the framework and aspects of implementation that will already be in place in your area or are being addressed by current or planned initiatives. It can help to have these mapped out against the core components of the i-THRIVE model for each needs-based group. The slide can be printed out and used as a group exercise during initial engagement sessions with staff to map out recent service developments according to which THRIVE needs group they relate to. Click here to download it. We are always interested to hear about people’s experiences of using these materials for their events. If you have experiences and feedback you’d like to share, please email Bethan Morris at bethan.morris@annafreud.org.